Play games at your next dinner party with AirConsole. Dinner party games are a great way to bring people together. Gaming at dinner parties with AirConsole is an excellent way to get people to open up to each other and start conversing. Gaming is a great way for anyone to relax, have some fun and a few laughs, especially amongst friends and family. It encourages the growth of friendship through competitive and non-competitive casual gaming. Video gaming is a great way to improve on things like hand-eye coordination, reaction time, problem-solving skills, use of strategy, decision-making skills, working as a team and communicating with one another or simply just having fun competitively. Dinner games are a great activity to get the family or friends together to talk, interact and have fun with each other. It is a memorable experience to have gaming included in any dinner party and make it a truly unforgettable night. AirConsole is a free online virtual gaming system that is designed to be played in a group setting for casual gamers, making it an ideal choice for dinner party games or any group of people looking to have some fun. All you need to do is log on to the AirConsole official website, pick the perfect dinner party game from our wide selection of dinner games, connect your smartphone and start playing! Anyone and everyone can participate in a gaming session using their smartphone as their very own personalized gaming controller and a smart TV or laptop as the gaming screen. AirConsole requires no special controllers or systems to buy, and it’s free. It is readily available to any casual gamers, or groups of people wanting to play. The website is very easy to navigate through your smartphone acting as your remote control. Just select and start your game. This game is fun and easy to play. It is an addictive casual game that anyone can quickly get the hang of and enjoy to the fullest. With its two button gaming controls, it is the game to play at any dinner gaming session if you are looking to have some competitive PvP (player vs. player) fun. The game features changing stages and gives players the ability to shoot at other players to remove them from the match. The last racer is the winner. Poly Racers is a great game for players of all levels to try out. This is a super-fast paced multiplayer PvP (player vs. player) game where players battle for food that makes their snake grow longer. At the same time, players must try to dodge other players and avoid moving stage pieces which petrify anyone that happens to encounter the stage or another player. As the game progresses, the game continues to increase in speed, making it increasingly more difficult for players to stay alive. The goal of this game is to play through rounds of battles snakes across different stages while trying to grow your own snake long enough to reach the finish line. Battle Snakes is an incredibly fun game with simple retro graphics game that’s ideal for any dinner time party game. Anyone can play this dinner game using its easy left and right controls and have a very good time. Friends Quiz gets the conversation going with random questions about your friends or family through a series of different questions. Anything can happen in this game! In it, you are quizzed on how well you know your friends and family. There are two different versions of this game available on AirConsole. One of these versions is designed for general audiences. The second version is a more intimate version that asks more intense and personal questions that may not be suitable for every audience. Friends Quiz is a great game to hang out and play with your family or friends at any time of day or whenever you are with the people you love. Friends Quiz is a mix of humorous and personal questions. You will find yourself, your family and friends laughing for hours when playing this game. Rakete is a multiplayer cooperative puzzle game with a very simple goal. All that is required in this game is that you and your team of at least five players land a rocket ship on a landing pad. It sounds simple enough at first, but this game turns into a difficult challenge very quickly. It is a good and fun game for boosting teamwork and friendship because it requires high levels of communication and trust to get through the mazes of this game. With each player controlling only one thruster of the ship, the team must cooperatively control the ship and guide it to the landing pad safely. This makes it one of the best dinner games to use as team building exercise with your colleagues. Tic Tac Boom is one of our most additive games. Tic Tac Boom is very similar to “Bomberman” aka “Dyna Blaster” the Nintendo hit game first released in 1983. It uses bombs to destroy the maze-like terrain, your team of friends and family and sometimes even yourself. The players must utilize the terrain and use various special power-ups. These power-ups may at times appear when items in the game are destroyed. The last man standing is the winner in this addictive game. Greek for Speed is an action arcade styled game. In this seemingly endless race, you and your friends are forced to rely on communication, trust, and faith in this 2-4 player game where everyone controls the same person at the same time. Everyone controls a single aspect of the game's character and has to use it in a timely fashion to get past the endless obstacles. There is never a quiet moment in this game because the game play is constantly changing. This game is all about communication, making it one of the best dinner games to play as an icebreaker at your next networking event. AirConsole has its very own karaoke console. It features more than 7500 songs with constant song updates to keep up with the latest music. Easily get started using your smartphone as the remote controller. With it, you can search through the all the songs that AirConsole Karaoke has to offer and select the song you want to sing. Your chosen songs will then be added to the music playlist, and you will be prompted when it is your turn to sing in front of your family and friends. Your smartphone is even your microphone! You sing into your phone, and the AirConsole Karaoke app keeps track of your songs. This great app is a great and free way to add music to all of your events and parties. This is a unique 2-5 player cooperative turn-based multiplayer game where you have to work together to defend your castle from enemy forces. This game has great retro visual effects and an easy to handle interface. This game requires a lot of team effort, and it puts communication skills to the test because of its short game timer between moves. Team moves and well-planned courses of action is necessary for this castle defense game. Otherwise, you and your team can quickly become overwhelmed and risk losing your castle to the enemy. Use what is at your disposal inside the castle walls to carry, run, and throw in your team’s catapults to launch and shoot at the enemy that is coming to destroy your castle. Defending this castle can prove to be much more than just a simple task as resources to defend your castle are scarce, and the monsters are tough and relentless. Cluster Puck 99 is another crowd favorite and is an exceptional choice to play at any dinner party. Cluster Puck 99 is a multiplayer cooperative sports game that has several similarities to hockey or soccer. It requires teamwork as the essential key to success in this game. Players compete to score goals using various strategies and approaches to their advantage. Cluster Puck 99 has a unique boost feature that allows a player to push another player very far ahead. It features a broad range of playing fields, some of which are maze-like, and numerous color variations. It is easy to have your dinner party going crazy. This game will have everyone hooked, and you can even play this game by yourself using AI (artificial intelligence) or with friends and family vs. AI. A great turn based on co-operative tower building where players take turns in placing pieces of the Tower of Babel on top of the tower base in an attempt to reach the heavens. Players are required to build the tower piece by piece. The wrong move can cause your tower to come crashing down, ending the game. Tower of Babel has some of the most stunning visual effects in our entire dinner party games list. It features stunning retro style graphics that are fused with bright, vivid colors. This game is a visual treat. A multiplayer game where everyone competes in different types of races and events to see who can accumulate the most points. Players can pick from a range of different characters to choose from and play. This fun 3D casual game brings out the competition amongst family and friends. Silly World is a good choice for family nights or dinnertime gaming nights. This game is especially fun for children under 14 to play because of its comical and animated characters and designs. Its fun and addicting races are sure to be a crowd-pleaser. The new hit game on AirConsole is a great multiplayer PvP (player vs. player) game. With its beautiful simplistic game design, controls, and visual effects. Cyber is a 4-player pong game that is highly addictive and competitive. Each player receives a limited amount of lives, multiple balls to hit, and crazy power ups. Cyber is a fun, fast and easy to play game for a dinner party that will keep everyone on their feet and having fun. Between two to four players can play this intense puzzle game where players compete to collect puzzle pieces fastest to advance to the next stage. Beware of the lava pit below the stage. Some stages have tiles missing, and players can drop below and die in the lava pit. Alternatively, you can push someone else into the lava pit and then take your time to solve the puzzle. This game is one of the newest additions to AirConsole’s gaming list. It is making a big splash with its stunning beautiful graphics and easy to use control scheme. It is one of the most played team-oriented games in AirConsole’s dinner party games list. Players compete in super versions of a football game of tanks. They must shoot, push, pass, cross, kill and score. Tank Ball is a great game for organizing teamwork and hosts up to 16 players with eight induvial players on each side of the field. With only one minute and thirty seconds of playtime per round, it is easy to play through hours of this fast-paced team sports game. This game can handle large and small parties easily. It is perfect for any size dinner party you are planning to host. With a particular mention to Poly Racers and Battle Snakes, these dinner games can handle much larger crowds as they can host many players. Poly Racers and Battle Snakes are two of the best dinner party games you can choose from to play at your dinner party. Along with hosting more players, these dinner games are both player vs. player. They also have short rounds so everyone at your party can have a chance to play and interact with each other. These games are fast paced to keep your guests on their toes and invested in their game. Since these dinner games are easy to play, your guests have a good chance to win and become the champions of your dinner party. For larger parties, you can use dinner party games such as ClusterPuck 99 that can host eight players and includes its own timer. It has a cooperative focus and requires your guests to interact with each other and take their minds off their daily lives. For your next dinner party, let AirConsole dinner party games bring the fun and keep your guests entertained. AirConsole has hundreds of other games to choose from that can fit with any theme of your dinner party. With our dinner party games, you have more time to interact with your party and more time to spend creating brand new memories. 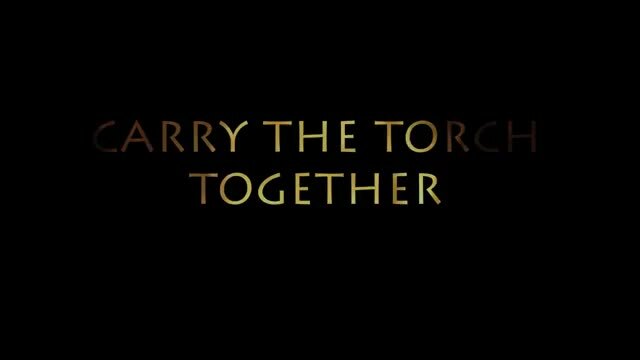 Carry the torch together in Greek for Speed - cooperate and concentrate!